Josh Allen is an American professional football player who plays in the National Football League (NFL). As of 2018, Joshua Allen currently plays for the Buffalo Bills as their quarterback. He played college football at the University of Wyoming. As a quarterback, Joshua Allen reportedly earns around $5 million as his yearly salary from Buffalo Bills. Further, Joshua Allen has an estimated net worth of over $21 million. Joshua Allen was born on May 21, 1996, in Firebaugh, California to parents, Joel Allen, and Lavonne Allen. As per his nationality, he is American and belongs to White ethnic group. Further, his star sign is Gemini. He grew up along with his siblings, Makenna Allen, Jason Allen, and Nicala Allen. Joshua Allen attended Firebaugh High School in Firebaugh, California where he played for his high school football team. After completing high school, Joshua Allen enrolled at the University of Wyoming and played for the University of Wyoming. The Buffalo Bills drafted Allen with the seventh overall pick in the NFL 2018 Draft and on July 25, he signed a four-year, fully guaranteed $21 million contract with the Bills. 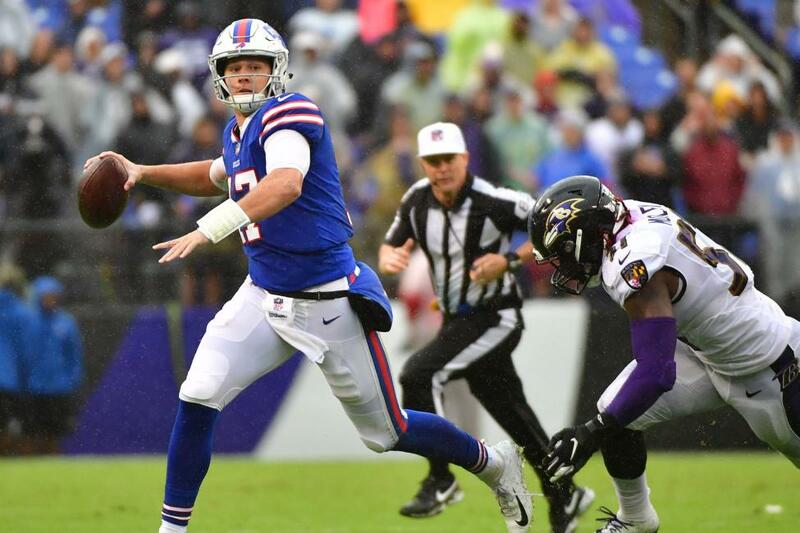 In September 2018, Allen made his first regular season appearance against the Baltimore Ravens and finished 6 for 15 for 74 passing yards. Allen finished with 245 passing yards, his first passing touchdown, and two interceptions against Los Angeles Chargers and also rushed for 32 yards. Against the Minnesota Vikings in week 3, Allen passed for 196 yards and a touchdown, adding 39 yards on the ground with two rushing touchdowns leading his team to victory. In Week 5, he completed 10 of 19 passes for 82 passing yards and an interception. Allen returned after missing four games due to an injury and played against the Jacksonville Jaguars, He completed 8 of 19 passes for 160 yards and a touchdown, adding 99 yards on the ground on 13 rushes and a rushing touchdown leading his team to victory. In a game against the Dolphins the following week, Allen threw for 235 yards and two touchdowns and added 135 yards on the ground. After a rough loss to the New England Patriots in Week 16, Allen rebounded in the rematch against the Dolphins. He scored five total touchdowns, three passing and two rushing, along with 224 passing yards and 95 rushing yards. This performance earned him recognition as the AFC's Offensive Player of the Week. The Buffalo Bills finished 6–10 on the season, 5–6 with Allen as the starting quarterback and became the first quarterback in Bills history to lead the team in both passing and rushing in a season. Josh Allen keeps on posting photos of him with his girlfriend on his Instagram page. The couple seems to be enjoying their romantic life. As for now, their relationship is going on strong but the duo hasn't been married yet. As of 2018, Joshua Allen has an estimated net worth of over $21 million. He reportedly signed a four-year, $21 million contract with Buffalo Bills in July 2018. Further, the NFL player has an average salary of $5 million annually. His salary for the 2018 season is reported to be $3,851,461. His total earnings this year will be about $13,965,844. He has so far earned $13,965,846 in his NFL career. Other than being a famous NFL quarterback, Joshua Allen is pretty famous in social media. He has 138k Instagram followers and 18.5k Twitter followers. Joshua Allen is not only a world-class athlete but also has a very attractive individual. The famous NFL star is 6 feet 5 inches in height and weighs around 108 kg.